Since its introduction in 2007, Velatura, the new marine collection by SEIKO has found favor among the world’s sailing and marine community with its distinctive design and its high functionality. The 2007 collection included two new calibers, the Yachting Timer and Kinetic Direct Drive. 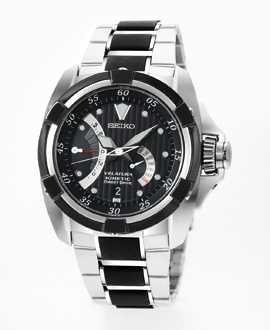 SEIKO Velatura is a collection of eleven high performance marine watches for men and women, each of which combines innovation of function with refinement in design. The Velatura collection 2007 comprised 11 models, with 4 calibers, 2 of which are new and designed expressly for Velatura. Since the creation in 1965 of its first diving watch, SEIKO has many times accepted the greatest challenge to the watchmaker’s skill – the challenge of building watches that can withstand the demands of ocean life. In 1975, SEIKO made the first diver’s watch in the world to have a titanium case and to be suited to saturation diving to 600m. Velatura continues a several decade tradition of watches built to take the strain of life on the high sea. Professional and recreational sailors alike require one thing above all else in their choice of watch: reliability. They have to be able to trust their watch to perform, year in and year out, without fear of it winding down or of battery drain. For the most demanding watch users on the high seas, Kinetic Direct Drive is the ultimate technology of trust. Wear it and it maintains perfect time. It is recharged by the wearer’s motion, but Kinetic Direct Drive can also be wound by hand. When winding the crown, the wearer can see the precise amount of energy generated on the Direct Drive indicator. Leave it for a few days and you can wind it to see the power being transmitted to the watch in real time – the perfect re-assurance that the watch is both operational and adequately charged. 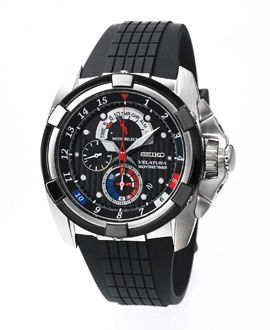 Kinetic Direct Drive is an expression of SEIKO’s emotional technology. It is built to allow maximum interaction with the wearer. It takes its energy from its wearer and allows him or her to relate in real time to its functions. To wear Kinetic Direct Drive is to experience time in a human, visceral and emotionally satisfying way. Like Velatura itself, Kinetic Direct Drive is built for the oceans. Sailing a 49er or any other racing yacht is a precision skill in which every wave, every gust of wind and every second is a vital opportunity to gain speed and time. And nowhere is this more important than at the start of a race. The SEIKO Yachting Timer is the instrument the racing sailor needs to hit the mark at the exact second of the start. Designed in consultation with top sailors from around the globe, it has a pre-race timer that sounds at 10, 6 or 5 minutes before the race start. These intervals are clearly shown on the brightly colored dial and the center hand that counts down the minutes and seconds is large, bright red and legible. After the race start, the chronograph takes over automatically and records the elapsed race time.